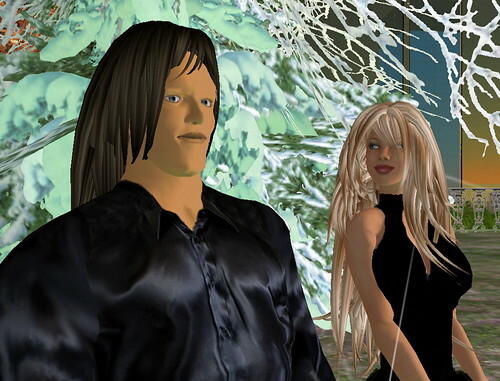 I have the good fortune of meeting and getting friendly with a wide range of people in my capacity of creating many large ‘environments’ across the Second Life grid. I often get invited to engagements, weddings, parties and a couple of funerals. A few months ago I noticed a couple riding horses around the Pond cobble lanes and then befriended Pollyanneke and scubasteve. They have many friends and are about to get married in Second Life (a 2nd attempt – story below) which I will video for them next week. To demonstrate and be more committed in world they are doing a potential world first – sponsoring a real world (read: developing or troubled world) child as a virtual couple inside Second Life. I interviewed them at their large mansion house inworld to understand their motivations and how significant this could be. scubasteve Canning: We never planned to meet, I was learning to build and Pol came up to me and asked me to teach her. Pollyanneke Pera: It was a rainy day for me in real life and thought why not for a day. He kept tp’ing (teleporting) me to teach me. I had zero interest really. scubasteve Canning: Yeah no intention of ever getting together but we had so much in common and we know each other so well. Pollyanneke Pera: But…the pull. We are an odd couple as it has turned out. Pollyanneke Pera: Not through building, he would’ve ditched me. We found at we had a lot in common, like horses and causes. scubasteve Canning: We both have horses in real life. Pollyanneke Pera: I think I met scuba his first day (rez day), he was such a cute shy newb. scubasteve Canning: Well probably after a month, but we have never met, just on phone. Pollyanneke Pera: We shared photos too he has a great voice though. Pollyanneke Pera: It’s weird when u know someone in one medium and then you get to talk, the voice will be different. scubasteve Canning: But we know each others voices and I love talking to her at work and trying to make her laugh. Pollyanneke Pera: He likes a challenge, must be a build thing? scubasteve Canning: For me its was after the first time Pol left me in Second Life and then I felt that I really like this girl. I took a pic of her that nite and we will always remember that nite she went away. Pollyanneke Pera: 🙂 That was awful nite, I didn’t know my password was saved to laptop. Oh real life sometimes doesn’t like second life to begin with until all is understood. scubasteve Canning: We will always be locked apart, we will always be together in Second Life. Together forever.. eternally apart.. thats us. So how do you think your relationship will change after the wedding next week. Also how big is the wedding? How many people coming to it? Pollyanneke Pera: well we can, but we won’t!, too perfect as it is. Sluv is a word scuba created… best word to describe how I feel about him. So you have taken a big step of adopting a real world child from within Second Life. Whose idea was this? Pollyanneke Pera: i saw the posters of madeleine mcann and I thought wow, what a medium for lost children. Then World Vision was having their 10000 appeal for one month and i thought hang on. Pollyanneke Pera: World Vision are one three aid based Non-Government Organisations (NGOs) in Second Life at the moment I believe. They need to look at Second Life in a big way I think. So many great people and from fairly secure lives. So do you think you are the first to do this? And how will the child be made aware that he/she is adopted by virtual couple! Pollyanneke Pera: My 1st sponsored child was from West Bank in Gaza. Her name is Abeer Mahmoud. She sent me one card that totally changed me last Xmas, it said ‘I love yo\u forever’” – and she doesn’t know me, she doesn’t need to. 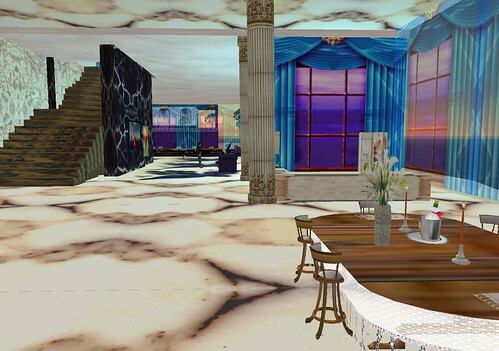 NOTICE: Second Life: Second Life will be closing for a scheduled update at 6am PDT. Watch the blog for details. At this point the second life grid closed for its bi-monthly update and the interview was sadly cut short. I will try to catch up with Polly and scuba at a later date, perhaps post wedding, to see how things are progressing. For now some information about World Vision. The best way to change a child’s life is to change the world in which they live. By sponsoring a child, you will help to bring about long-term benefits to the child, their family and community for just $43 per month. Your support will help to fund vital development work in the child’s community, such as digging wells, improving sanitation and building health clinics. This work ensures that the community will be able to provide the children with the basics they need, which helps them to grow up in a healthy environment and have the chance for a better future. Well, first of all: congratulations! It’s always nice that people meet and find their “soul mate” in real life or in a virtual surrounding like Second Life. As far as your initiative to adopt a child, I’m only very happy to hear that. The link between virtual life and real life charity should be promoted wherever it can. And – as you know, looking at the message you sent me – I try to raise as much money for charity as I can. Not trying to get rich myself: at least 90% of all gifts go to charity and we try to spend as little as possible on costs. So be generous and give to Socrates Repine, our financial controller. And when you think about opening a bank account at JT Financial, please contact him too: we get 0-01% interest of your bank account, not lowering your own interest (it stays 0.15%!). Just by using our ATM when you open your bank account, you take care some money goes to charity. And to Pollyanneke Pera and scubasteve Canning I’d like to say: keep doing the right thing by sponsoring World Vision for only $ 43 a month. And remember: we also have ways of sponsoring children in the 3rd world for less than $ 10 a month. They have food, can go to school and get a decent life in that way. Save the children, they are our future!